Wow, I can't believe it's been six weeks since I last posted about what I've been comfortably wearing while my preggy belly is growing tremendously. If you'd like to see the first part, it's over HERE. If you've been following me on Instagram, where I usually post my Outfit Of The Day photos, you'd notice that I am very safe when it comes to color combination of my wardrobe. I actually notice lately that I like wearing blues, greys, whites, blacks and denims, and I like the striped pattern. I'm drawn to these classic and cool-to-the-eyes hues. I guess it's because I'm having a boy? I don't know if there's any connection really. This is my regular outfit to work lately. I stopped driving because my belly is too big that it gets squished when I try to reach for the lever at the bottom of the seat to adjust it. So, now I commute and when I do, I want to be in the most comfortable clothes I could wear. Simple cotton top, jeans, and sneakers work for me all the time. 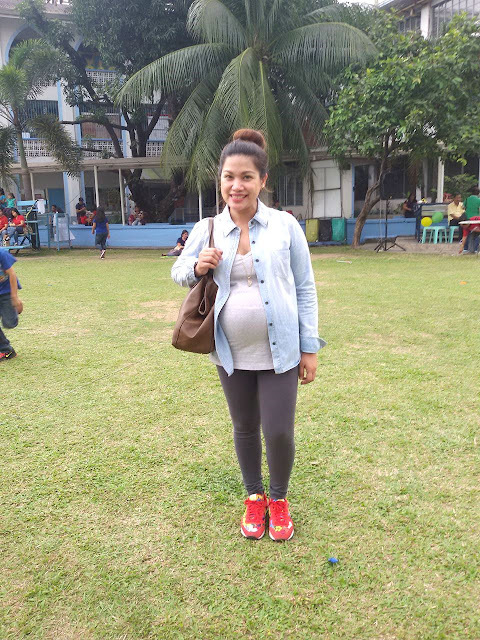 I attended my elder son's field demonstration day in school wearing a comfortable maternity denim pants, a stretchable striped top and my ever reliable Nike rubber shoes which I gifted myself last year. Commuting to work means a lot of walking is involved getting from one point to the other, especially when your work place happens to be in Makati, where you cannot just alight in front of your building. I walk about a block from the point where I unload from the service van going to the office. A few minutes solo time while walking is all I need to keep my thoughts together and mentally plan what I need to do for the day. It's therapeutic, try it too! Usually, I wear leggings to the gym or when running. 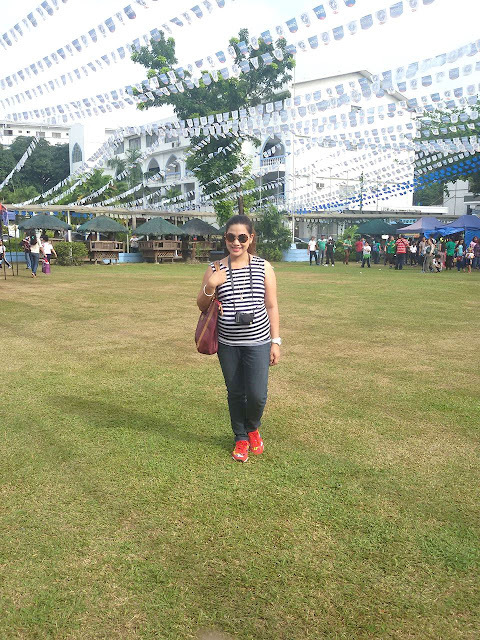 But since I can't do both just yet and I don't want to tuck away my leggings, I use it on weekends when going to the malls or when attending a school activity with my sons. The chambray top is one of my favorite closet pieces because it's really versatile and can be matched with any color. 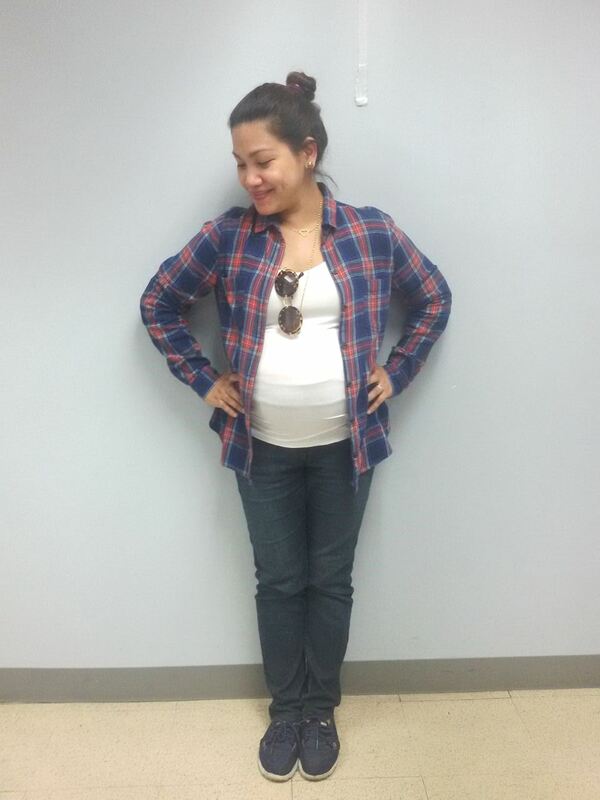 Since my preggy belly is out there and about, I didn't button it up, it served as a layer to my very fitted tank top. Husband and I came from the diagnostic clinic to get tested for Gestational Diabetes. I also requested for CBC and Urinalysis to ensure I'm okay. Happily, as if I hit the lotto's jackpot, the results showed that I'm negative for any blood or urine infections especially gestational diabetes! We had an ultrasound and found out about baby's gender! Before going to my OB to bring good news, hubby bought me a bouquet of roses and a heart-shaped balloon as his advance Valentine's surprise. I'm wearing my comfortable Gap V-neck cotton shirt I bought from Surplus in SM, a denim short shorts I bought as well from SM Woman Maternal and my durable and soft-cushioned Skechers GoWalk2 shoes for that busy day. 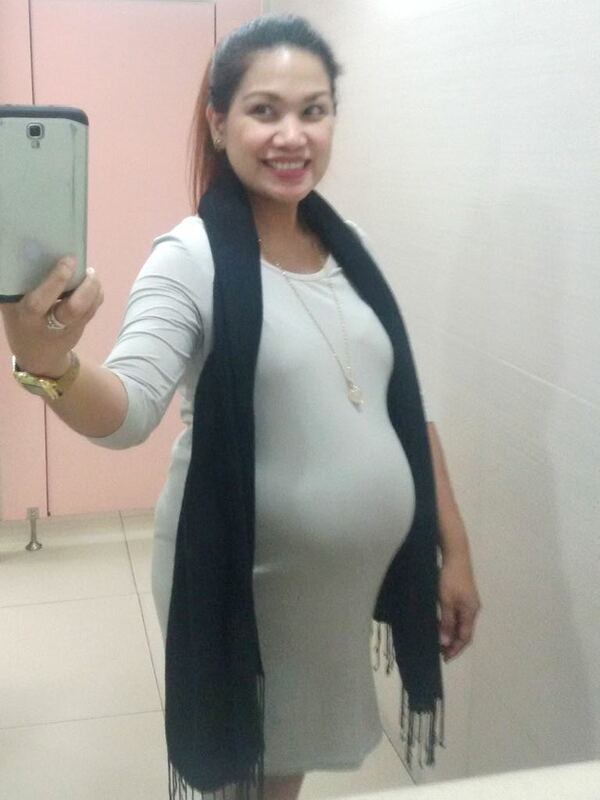 This stretch beige dress definitely shows my preggy belly because of its material. This 22 weeks belly looks like it's 36 weeks, some say. Well, what can a big-baby-carrier momma do? I really carry big babies (9.2lbs and 7.8lbs normal delivery of my first 2 boys). So I carry a dependable Pashmina shawl with me to keep me warm because the air-conditioning in the office is unpredictable at times. Style and comfort, this is what it is. This is a usual casual work outfit. I just layered my striped shirt with a blazer and I looked a little more corporate than without it. I wore my maternity flare denim pants which is a hand-me-down from a friend (who doesn't want to get preggy again) and paired it with my reliable Nike shoes. Macky and I went to our Wednesday DGroup in CCF which we attend weekly to make our marriage stronger and know more about God, relationship, love, forgiveness, parenting and so much more. Our DGroup is comprised of 10 couples who gather weekly and support each other when it comes to marital issues, knowing God, parenting and so much more. It's been our recent food for our souls and it has helped improve our marriage. Going to the mall like this could never do me wrong! 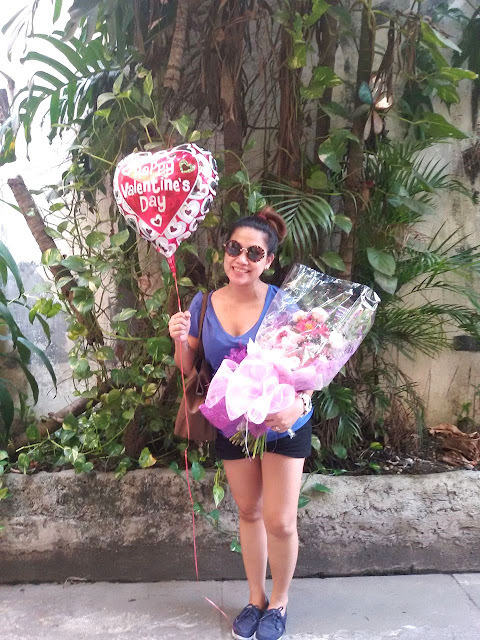 I attended two events with the whole family last week, one is the advanced screening of Kung Fu Panda 3 and the other is School of Styling's Corsage, Boutonniere, and Bouquet making workshop, which I will be writing about in a few days. 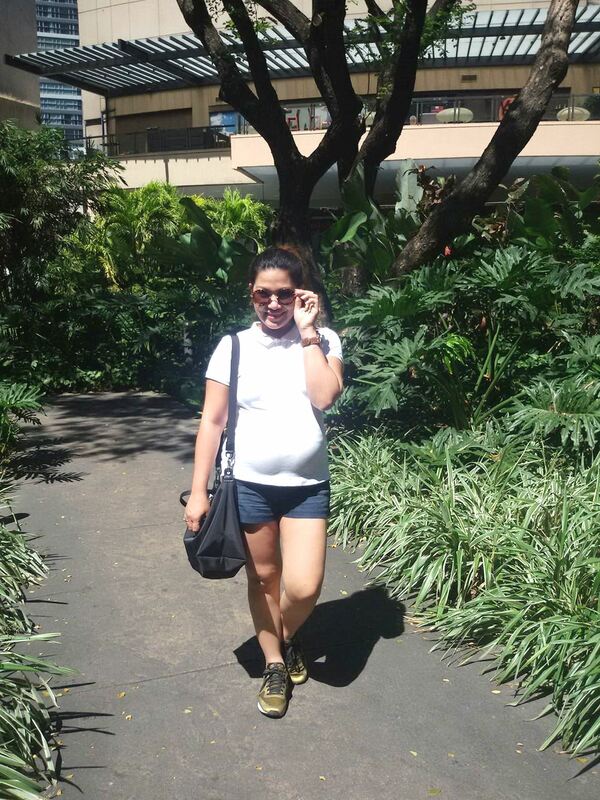 :) The shirt from H&M is stretchable and my preggy belly snugs just right. I love wearing my maternity shorts on a weekend because it's a break from my usual smart-casual/corporate pants and dresses from Mondays-Fridays. Before updating your maternity wardrobe... look into your closet if you've kept some pieces which you could still use. If you can't use them anymore because of size or the style is very outdated, better give it away by donating or selling it. The key is to mix and match your clothes. I always go for classic and safe colors. One could never go wrong with the basics. If you do want printed or loud colors, mix and match them with existing solid colors from your closet. No need to keep on purchasing pieces of clothing which will only clutter your closet. 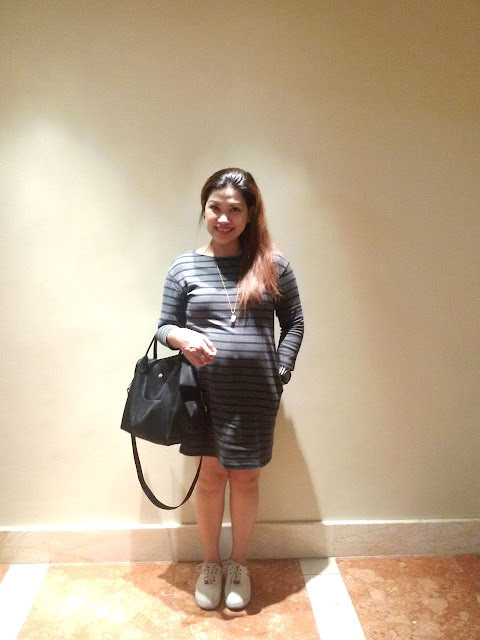 Do an inventory of your pre-maternity clothes which you could still use even when your preggy belly grows. 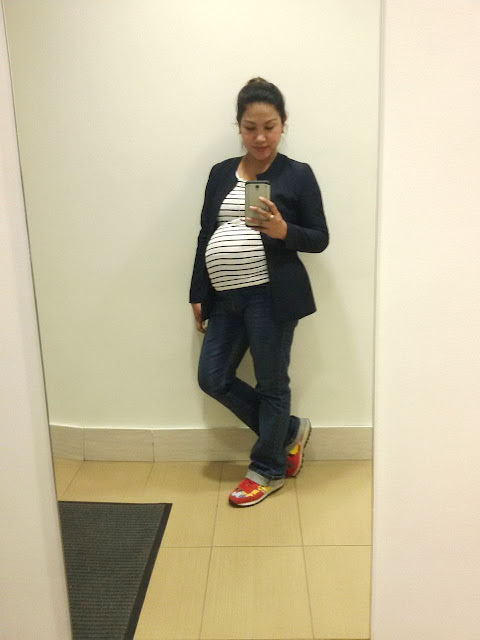 My closet is full of stretchable and comfortable tops which could handle my big tummy. I like wearing this type of clothing because it's comfortable, it hugs my tummy firmly, it's versatile, it can be used for even after the baby's out. 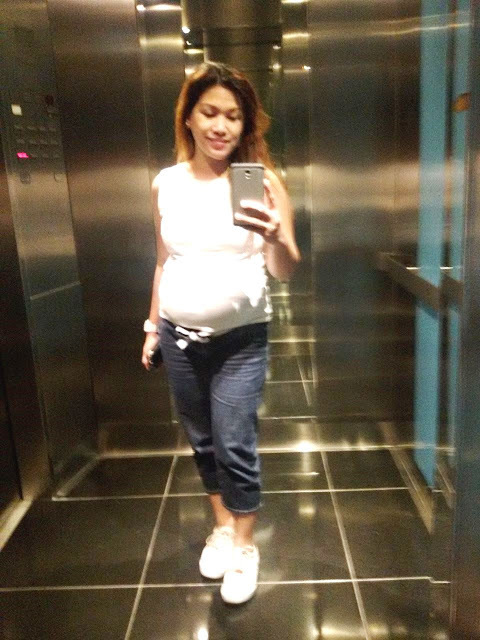 Those button-up shirts could still make its way to your maternity get up. You don't need to button it up, use as a layer to a fitting tank top. This gives your outfit an updated and chic look.